Standing in the shadow of the Elizabeth Tower (home of course to the world-famous bell, Big Ben) is Portcullis House, a large annexe providing offices and facilities for Members of Parliament. Opened in 2001 at a cost of £260 million, Portcullis House is certainly a tough looking building, designed with a high degree of security in mind. 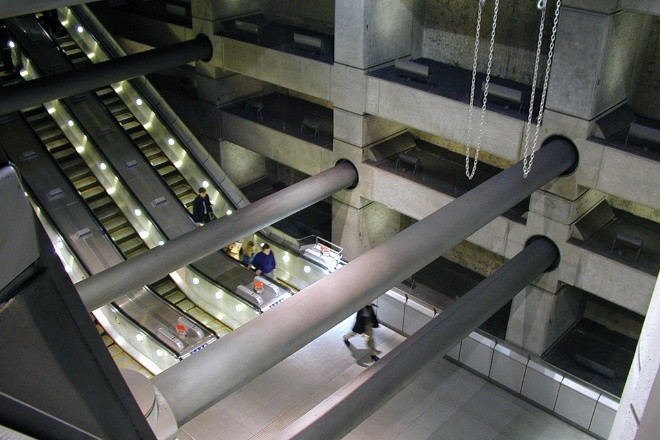 It is also perched directly above Westminster tube station, allowing commuters to view the office block’s hefty foundations as they glide up and down the escalators. 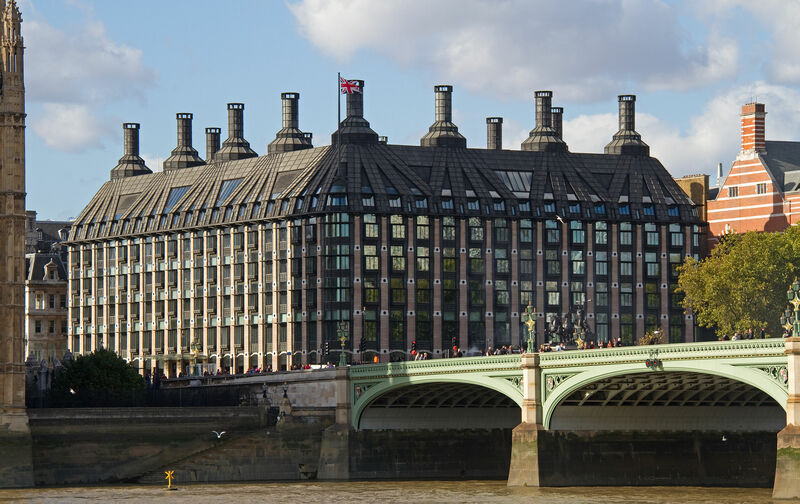 Although Portcullis House was commissioned in 1992 the need for extra room at the Houses of Parliament had been recognised twenty years earlier. 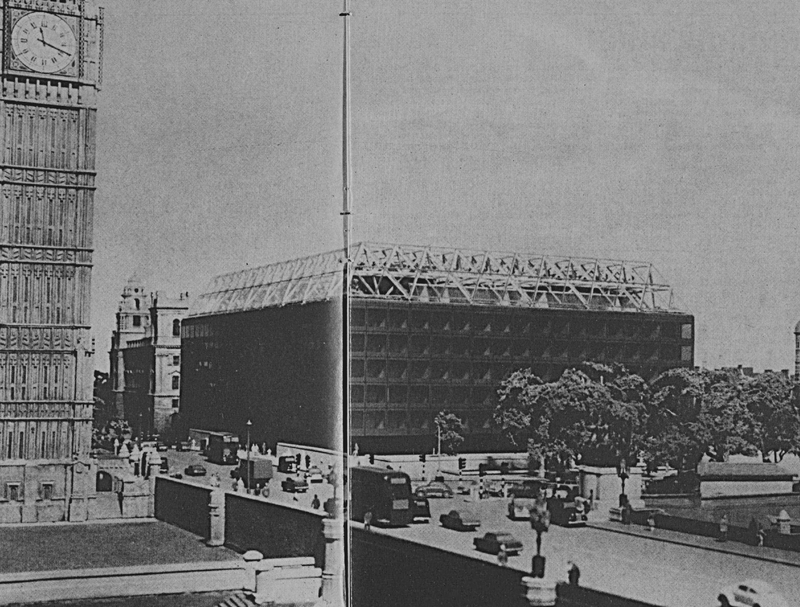 In light of this, a competition was held in the early 1970s seeking designs for a parliamentary add-on. 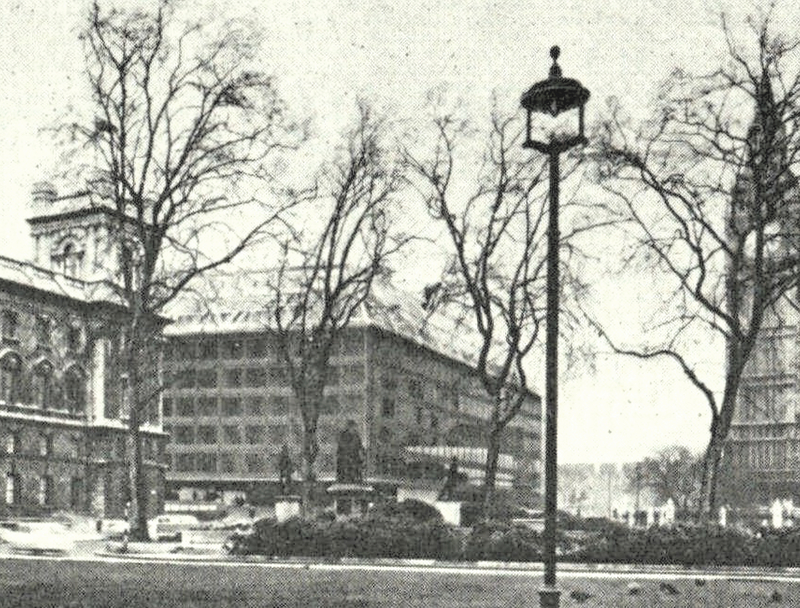 246 entries were submitted and the winner was Robin Spence- nephew of Sir Basil Spence, the architect noted for his work on projects such as Coventry Cathedral and London’s Hyde Park Barracks. 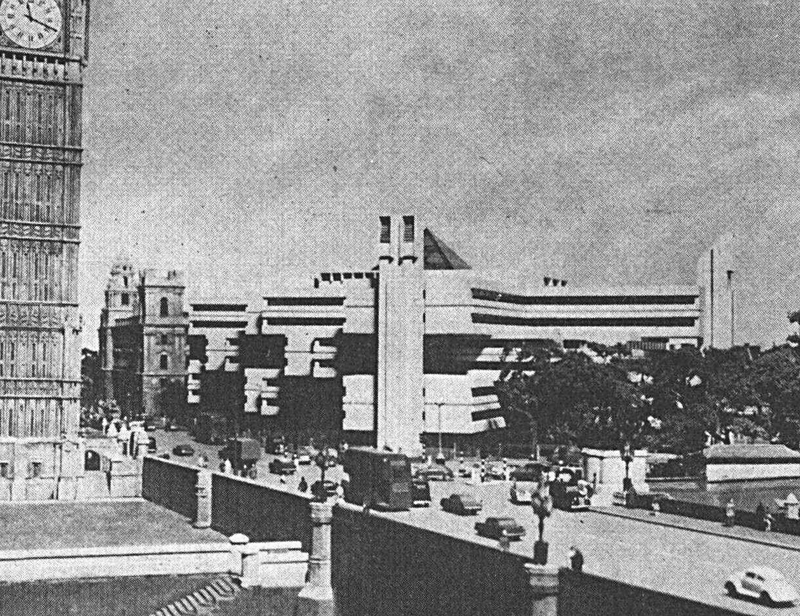 Along with essentials such as an assembly hall, offices and a large library, Spence’s design also included a roof garden, sleeping cubicles… and, to spoil MPs further, a swimming pool, sauna and ‘travellator’ moving walk way link. The building would also have been raised on columns, allowing for the provision of a public forum area below. The estimated cost of the project was £7 million…. Although Robin Spence won £8,000 for his work, his design never came to fruition. His entry, along with those of the runners-up, were published in the Illustrated London News, in April 1972 providing a fascinating insight into a Westminster that never was…what do you think of the designs? 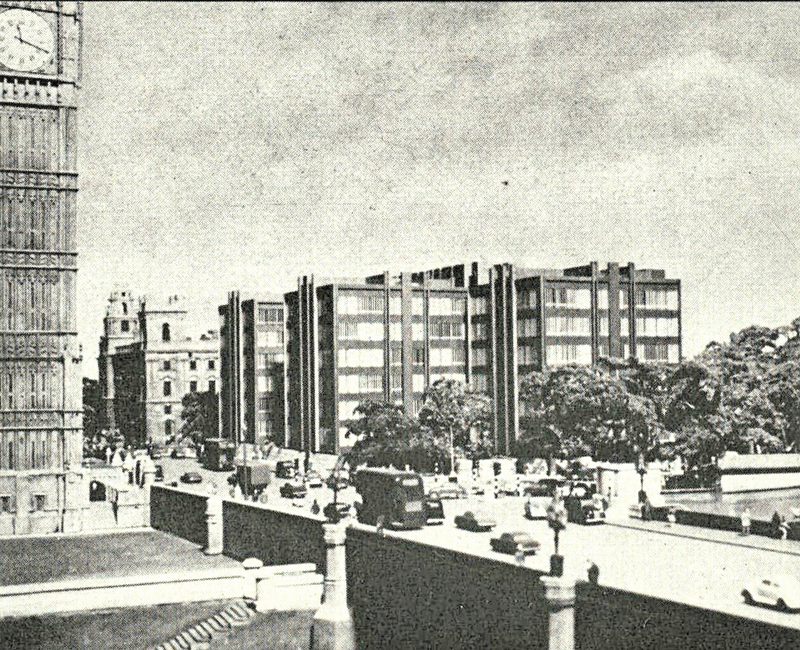 A design incorporating vertical towers as a nod towards the original Parliament building’s architecture. 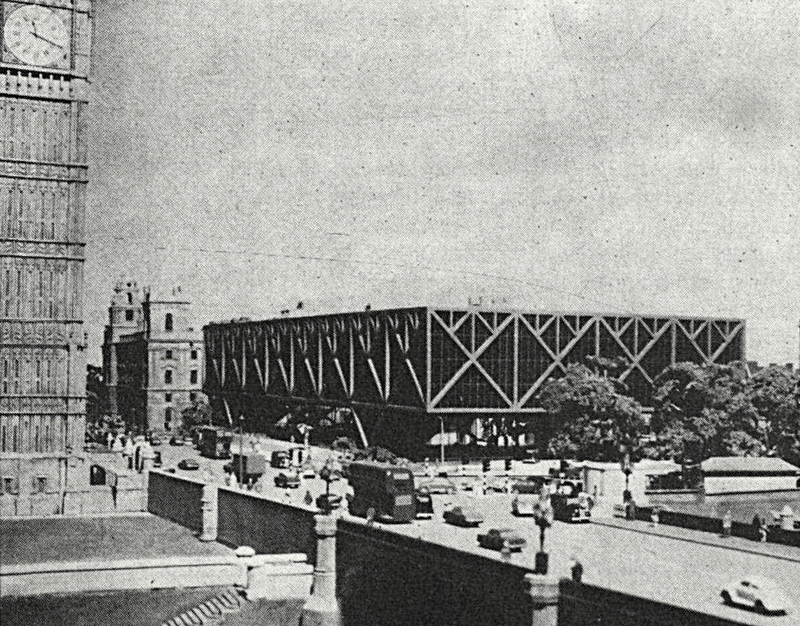 A box-like structure which would have incorporated bronze glass windows. An ultra-modern vision made up of interpenetrated floors. Wasn’t there a Joe Lyons there? My mother remembers one there in the forties. Sounds very likely. 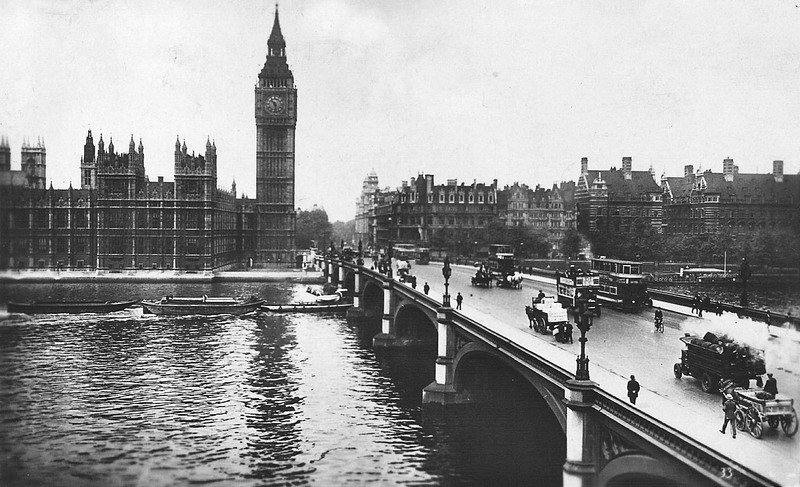 My grandmother, originally from Bristol, recalls visiting a Lyon’s Tea House when she came to London for the Festival of Britain in the early 1950s…may have crossed Westminster Bridge and popped into the one you mention. Will have to ask and see if she remembers which one! Not sure I liked any of the losing designs that much either. I like the joint third – rather Brutalist style.